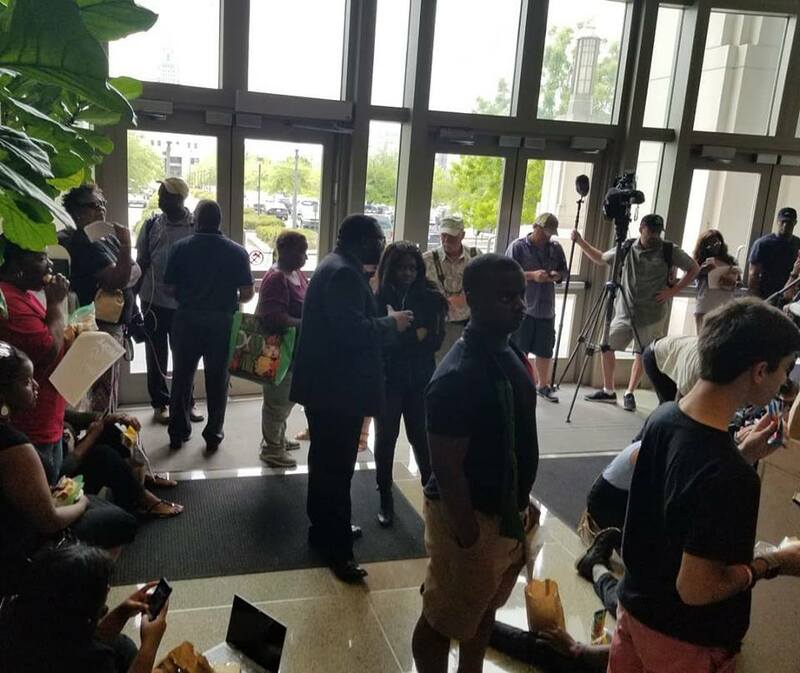 Baton Rouge (PPN)- The state president of the NAACP, Mike McClanahan, and local community activist brought lunch to the Attorney General’s Office in an attempt to have a peaceful dialogue regarding their disapproval of Attorney General Jeff Landry decision not to pursue charges against Blane Salamoni. 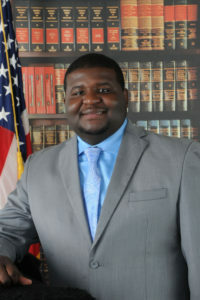 Community members believed that Jeff Landry did not follow the correct process regarding his investigation into the shooting of Alton Sterling. Community members issued a call for action via social media with these two flyers. That decision cause members of the community to question the authenticity of the justice department. “We feel that if Jeff Landry would have taken this case to the grand jury that all things would have been transparent and we would have known that the process wouldn’t have just worked for some but all people. We can’t pick and choose who we want to go through the process, everyone that commits a crime should go through the process, a police officer is no different”, said McClanahan. 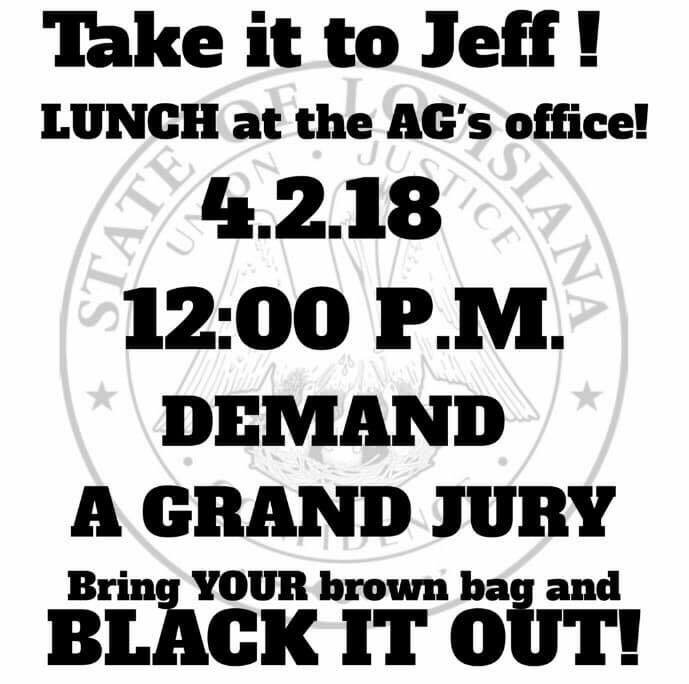 The group of protesters was greeted by security at the Attorney General’s Office who told them that Jeff Landry was not in today. McClanahan asked personnel several times to speak with anyone who could address their concerns. 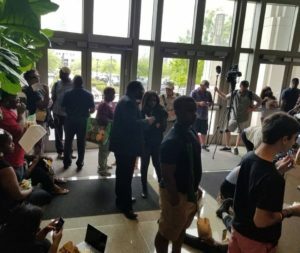 The staff said, “there is protocol, you can’t just come up here without an appointment.” Immediately, after their request was denied, protesters began eating lunch in the lobby of The Attorney General’s Office. 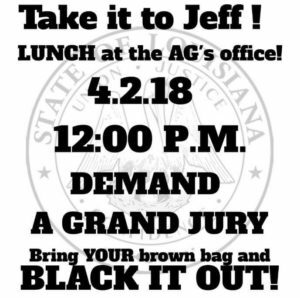 “Lunch Day” at the Attorney General’s Office was organized in hopes that Attorney General Jeff Landry would hear their plea and convene a grand jury regarding the shooting of Alton Sterling. Many elected officials and former law enforcement personnel weighed in regarding Attorney General Jeff Landry’s decision. “By way of background, in 41 years as a federal and state prosecutor I have tried to administer justice blindly, with only adherence to the law and my integrity, not political pressure, friendship or fear. I prosecuted the killers of Barry Seal, members of a vicious drug cartel when no other state prosecutor wanted the case. I have prosecuted civilians and members of law enforcement who violated the law and their oath of office. I also vigorously prosecuted the cases of BRPD Corporal Betty Smothers and Officer Warren Broussard, a BRPD officer killed in the line of duty. That case was in the hands of two assistant DAs for over three years under the Bryan Bush administration and the last prosecutor told newly elected DA Doug Moreau it was too hard to be prosecuted. Doug pulled the case and gave it to me. For three months I reworked the case with my investigator and members of the BRPD and the killer is now serving a life sentence. I have also presented the cases of officers killing civilians in the line of duty, always going to a grand jury. For 18 years Moreau served as DA, that was the policy and also for the first term of Hillar Moore. I was the First Assistant in charge of grand juries for the last seven years in that office under both Moreau, a Republican and Moore, a Democrat. Political affiliation should never have any relevance to prosecution. For the last three plus years of the Moore administration, the cases of police killings of civilians now are internally reviewed and a report issued at a press conference. I disagree with this change. In all cases, right or wrong, the officer, decedent and community are entitled to have these matters reviewed quickly by a panel of peers-citizens of our parish. The AG appears to have decided to make a very troubling case decision internally. We deserve more, which is not a reflection on the ultimate outcome.If Landry’s decision was correct, the grand jury would have not indicted, reaffirming his position. I make this lengthy statement as I have been personally attacked by people I do not even know who have not spent their lives defending the rights of others when I merely stated the better practice was to have presented to a grand jury. I truly pray that over this Easter weekend we can all begin to heal and not degenerate to personal attacks. Discussion is wonderful and the various points of view are what makes us grow, but please as civilized human beings”, said former Federal Prosecutor Prem Burns via Facebook. “Attention: Fellow EBR public servants and community leaders, PLEASE STOP asking me if the city will be safe tonight. BLACK people will not burn down Baton Rouge bc Officer Salamoni is the coward we knew he was before the videos were released today. BLACK people didn’t burn the city down in July of 2016 and we won’t now. 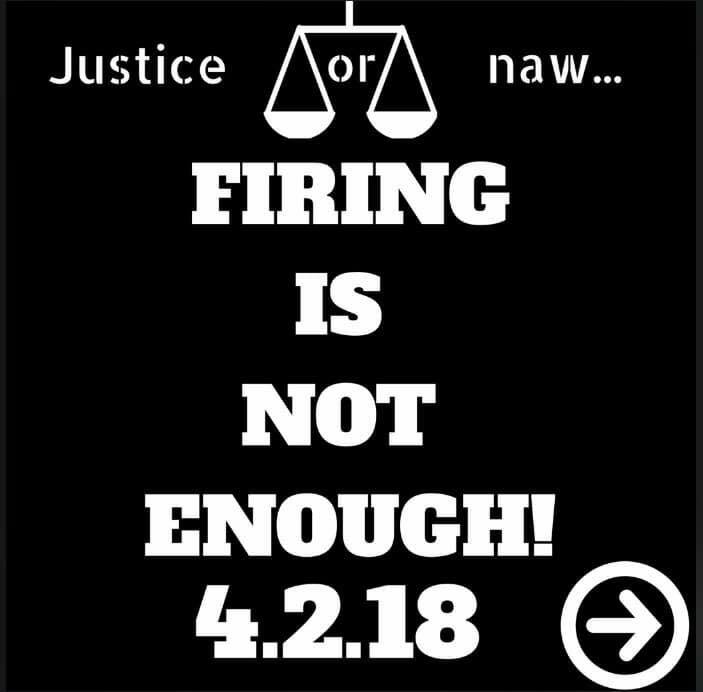 Your fear…..your calls/texts illustrate one of 2 things: 1) you have the same bias about black people as Officer Salamoni or 2) You were equally disgusted and offended by the videos, and you fear that the disgust will lead to an uproar. I ask that you open your hearts and be honest with yourself. I wish your messages said: “Ted, I saw the videos and I’m disgusted. While I can never feel the way you feel, I recognize the concerns you have and the anger you must feel. I was on the fence before, but today I see things through a different lens. As someone who supports the men and women in uniform, I can’t defend what I saw today.” It’s that simple, and it doesn’t make you a bad person to call out wrong when you see it. If ONE brave person says publicly what you have said to me privately, we can honestly begin to work towards the change we need in our beloved BR. It’s been said that nobody hates a bad officer more than a good officer. If that statement is true, the good officers should be rejoicing at the firing of the bad officer. But the great officers should stand up and condemn what they saw today. The community needs to hear that. I love Baton Rouge, and I love each one of you too much to sugar coat things with you. I’m focused on making this a pivotal moment for our city – and that may mean getting you outside of your comfort zone. If you claim to love Baton Rouge today and aren’t saddened for our city, I question if you really love her as much as you say you do”, said State Representative Ted James via social media. Copyright 2018 Pen Point News. All rights reserved. This material may not be published, broadcast, rewritten or redistributed.